The past two weeks or so, we’ve been bouncing around Jerusalem and making a few excursions to outlying areas. Yesterday was one of those excursions, and a kickin’ lunch view to boot. 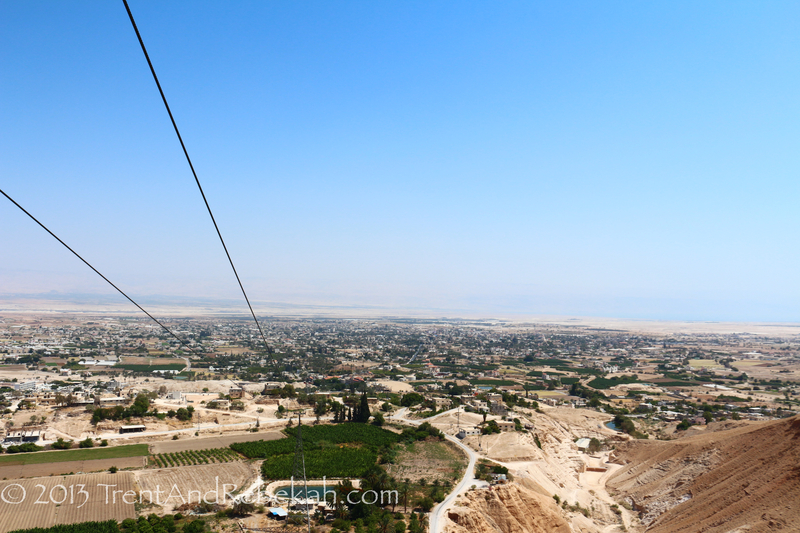 Enter Tel es-Sultan, Jericho, City of Palms, and the Mt. of Temptation (the first three being the same, the later is a separate entity). The shots below were taken from the “Mt. of Temptation,” just west of Jericho. 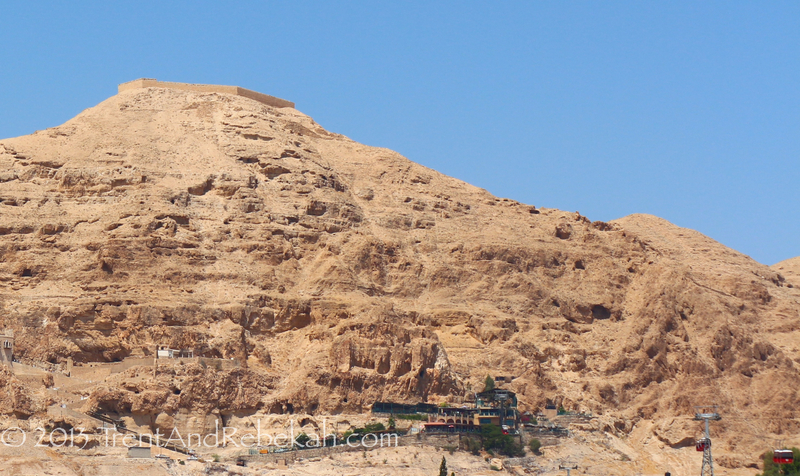 As the name implies, this is the traditional location where Jesus was “tempted” by the devil (Matthew 4), and a Greek Orthodox monastery atop the mountain is perched there to remember this tradition (this tradition has no relation to Old Testament history). 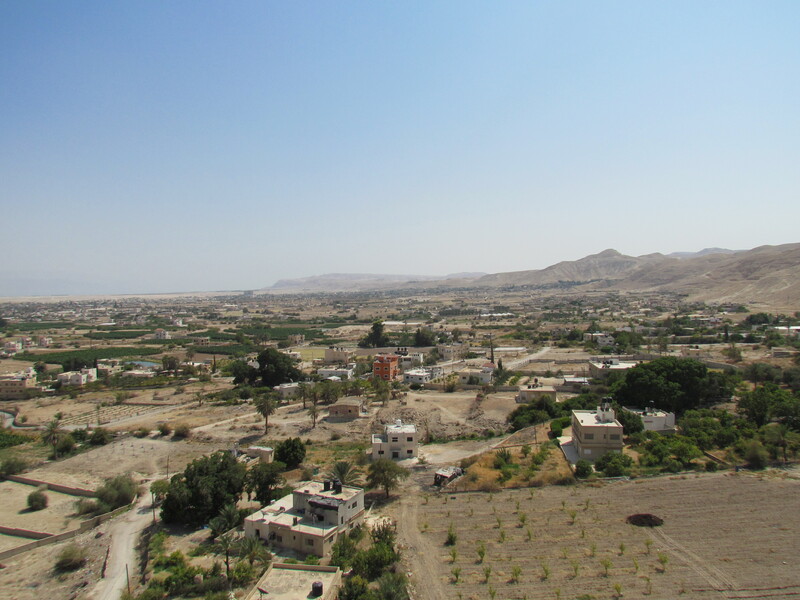 From the photos blow, you can see the setting (albeit through the desert summer haze), a good visual backdrop to verses mentioning geographical and physical aspects of Jericho’s setting it in Biblical texts. A word about the cables in the photos later in the post. Closer shot of the Jericho tel from the Mt. of Temptation. The building that is most prominent, between the cables just before they reach the tower, is just in front of the tel. The tel is what appears to be a long sandy/grayish hill or mound. 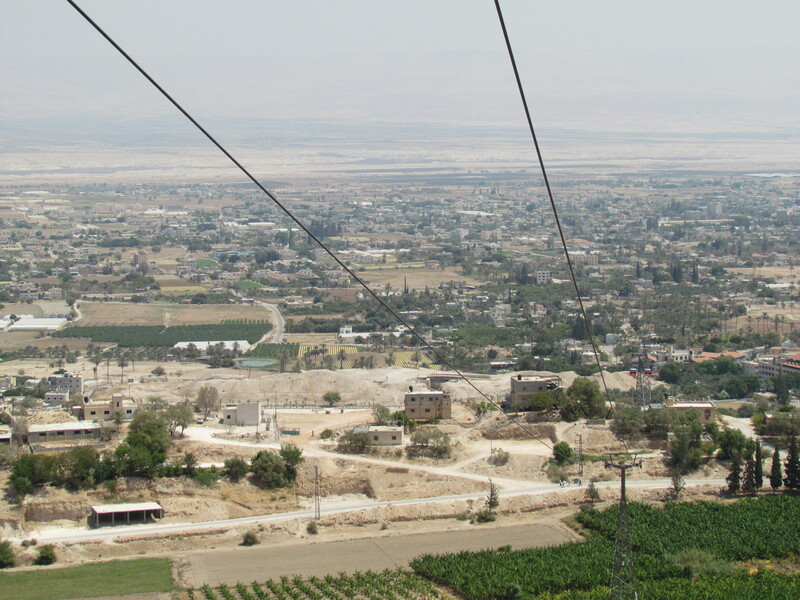 It extends slightly to the right, you can see a second gondola/cable tower (with gondolas just in front of it) covering the southern edge of the tel. It extends left to the group of buildings at the end. From the angle of the first photo, you can see two interesting things. One is the Jordan River Valley, or the Great Rift Valley as is it sometimes referred to. In the bottom right corner, you see the edge of the Judean Hill Country dropping off into the Jordan Valley (same mountains from which the photo is shot). The Jordan River resides in the bottom of the valley, thus, “on the side of the Jordan across from Jericho.” Number two concerns the north end of the Dead Sea. It’s hard to see in this photo, again, because of the summer haze, but halfway up the photo on the right side, where the land appears to become sky, a portion of that blue is actually water of the Dead Sea. This provides another interesting point in that just above the Dead Sea on the other side of the Jordan is known as the “plains of Moab.” So the “plains of Moab” and “across the Jordan,” are two things we can see in this photo, described from Numbers 22:1. Below is a shot of palm trees from the tel, along with other items of agriculture. Given the heat and barrenness of this area, you can certainly see were springs of water (or rivers) make a difference, especially when harnessed for irrigation. Palm trees and other agricultural items from Jericho. 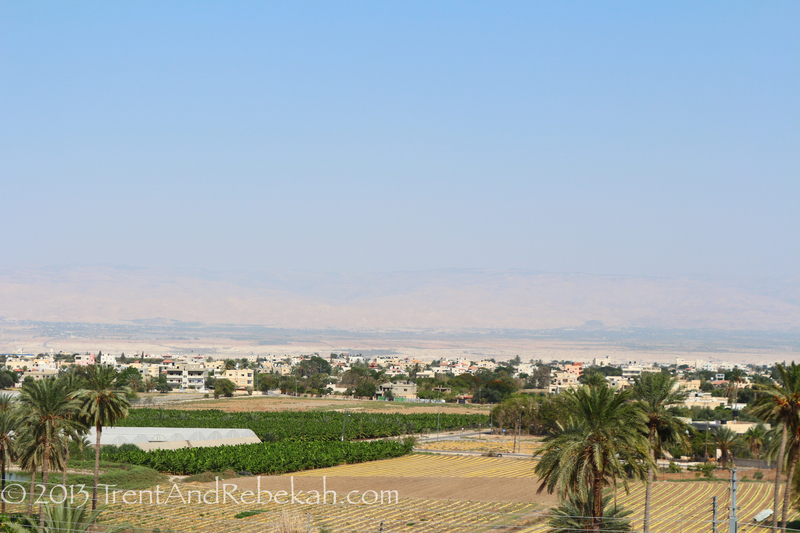 You can also see the mountains of Jordan in the background, across the Jordan River Valley. This verse is in the context of Joshua sending the spies to Jericho and their interactions with Rahab. This verse is where she helps them escape after it is suspected by some in the city (who informed the king), that Israelite spies had come to investigate the city. The photo below is looking south from the Temptation Mount and provides a good profile view of mountains they could have hidden in. The Judean hills “behind” Jericho to the west would have been a logical hiding place, since the search party would have probably looked east, toward where Israel was encamped across the Jordan. Lastly, there was a mention above about the cables in the photos from the top Mt. of Temptation. While Mt. of Temptation has the monastery on the side of the mountain, it also contains a few shops, a restaurant, and a snack bar or two. How do you get to that spot on the side of the mountain? Yep, that’s where the cables come into play. For a nominal fee, you can ride a snazzy set of cable cars up to Mt. of Temptation. There you will be tempted by an assortment of souvenirs and food. We failed the food portion of the test, as you see below. This view show the restaurant in the center, cable cars to the right side, and the monastery staircase is visible to the left along with the edge of the monastery buildings. So, if you ever make it to the top of Mt. 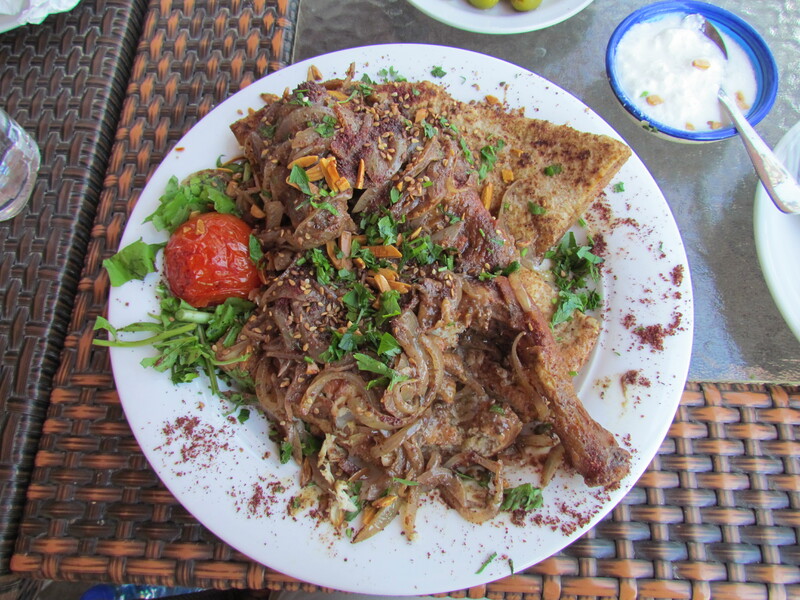 Temptation, soak up the views that help you see the surrounding of Jericho and the Jordan Valley, and pay a visit to the Sultan Restaurant. 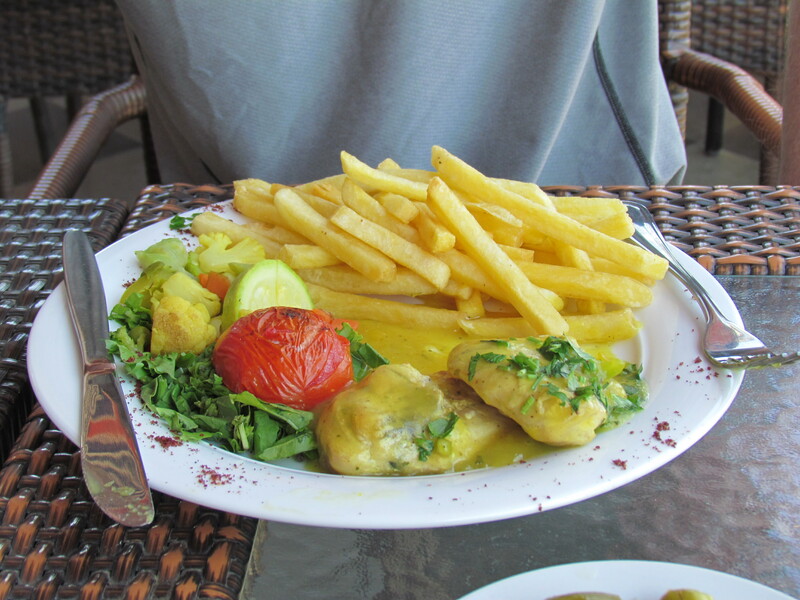 It’s not as pricy as you would expect, for a touristy restaurant, and provides stunning views of the Jericho and the Jordan Valley (if you can acquire a table out on the terrace). This entry was posted on August 28, 2013 at 4:44 am and is filed under Ancient History, Biblical Site, Nature, Whimsy. You can follow any responses to this entry through the RSS 2.0 feed. You can leave a response, or trackback from your own site.